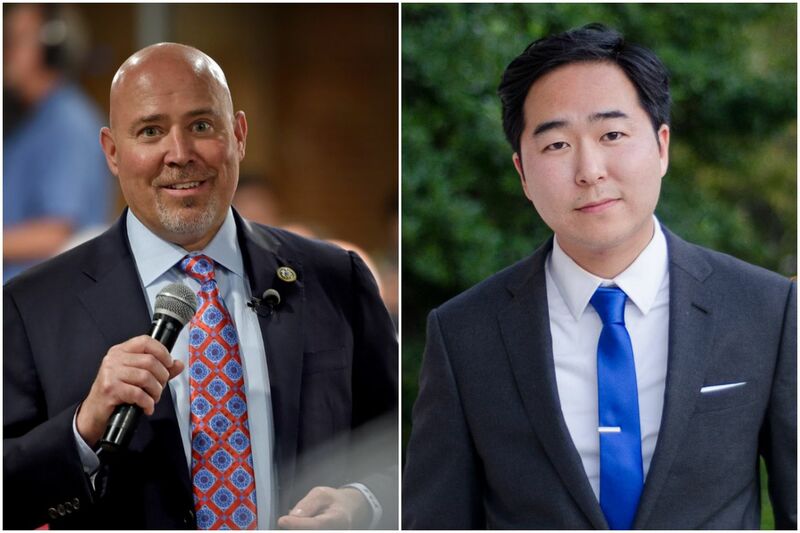 A new poll shows a virtual tie between U.S. Rep. Tom MacArthur (left), a South Jersey Republican, and Democrat Andy Kim (right). They are running in one of the most competitive U.S. House races in the country, based in Burlington and Ocean counties. TOM GRALISH / Staff (right); Courtesy of the Andy Kim campaign (left). WASHINGTON — U.S. Rep. Tom MacArthur and his Democratic challenger, Andy Kim, are running neck and neck in a pivotal South Jersey congressional race, according to a Monmouth University poll released Tuesday. The survey, one of the first public polls in a race targeted as critical to the fight for control of the House, also shows a stark geographic split in the district's views on President Trump, relatively low voter enthusiasm, and mixed reviews of the GOP's signature tax bill, which MacArthur supported. Overall, the poll found MacArthur leading by 41 percent to 40 percent among voters who have participated in an election since 2010 or are newly registered. Kim, however, takes a narrow lead in models based on past midterms or in a Democratic surge like the ones that have been seen in other congressional elections this year. Minutes after the poll was released, nonpartisan analysts at the Cook Political Report shifted their forecast of the race from "leans Republican" to "tossup." "Considering this is a Republican-leaning district, the results suggest that MacArthur faces a significant challenge to keep his seat," said Patrick Murray, director of the Monmouth University Polling Institute. But he cautioned that New Jersey's electorate is "notorious" for deciding late. "That means these poll results reflect the fundamental contours of this race before voters actually engage with the candidates," he said. The race in a district that President Barack Obama won twice and Trump captured in 2016 is considered one of the most competitive in the country. — A major geographic split: In the Burlington County piece of the district, which is in the Philadelphia media market, voters are down on Trump: 38 percent approve of his job performance against 57 percent who disapprove (including 48 percent who strongly disapprove). But in the Ocean County portion, mainly in the New York market, 56 percent approve of Trump's work (including 41 percent who strongly approve) and 39 percent disapprove. "Both candidates will need a combination of tactics to motivate their base and persuade undecided voters. The relative weight they give to these strategies is going to play out differently in the eastern and western parts of the district," Murray said. — Not as much enthusiasm: 49 percent of voters in the district expressed a lot of interest in the congressional race. That's below what the poll has found in six other competitive races around the country, where interest has ranged from 53 percent to 62 percent. That might be a warning sign for Democrats, who are hoping a fired-up base can carry their campaigns. — Tax bill struggling: The poll found an even split on the Republican tax bill, with 40 percent approving and the same share disapproving. GOP lawmakers had planned to campaign on the measure, and MacArthur took a risk in backing it — becoming the only New Jerseyan from either party to vote for it. Many more voters (45 percent) expect their taxes to go up because of the bill, while 13 percent expect to pay less. Independent analysts project that the vast majority of taxpayers should pay less, but the issue is complicated in New Jersey, where a popular break for local property taxes was capped. — Little-known challenger: MacArthur was viewed favorably by 30 percent and unfavorably by 19 percent, the poll found, with 52 percent having no opinion. Kim is mostly unknown: 68 percent have no opinion on him, 20 percent see him favorably, and 11 percent see him unfavorably. The poll surveyed 401 voters in the district from Aug. 7 to 9. It has a margin of error of 4.9 percentage points for the full sample and 5.7 percentage points for the likely voter models.